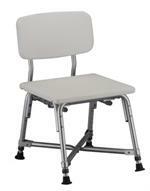 Bariatric products are specifically designed for heavier patients. We carry a large line of products for all your Bariatric needs. Choose from ambulatory aids such as canes, walkers, crutches and wheelchairs as well as ankle braces, back braces, knee braces, commodes, and bathroom benches all in Bariatric sizes.